At great heights the wind blows much more powerfully and steadily than it does at lower altitudes. Some companies are convinced that there lies an opportunity to generate cheap, durable energy. The most important disadvantage of wind power is that there is not always (enough) wind. Wind turbines only spin one tenth of the time at their maximum output, which makes wind not a very reliable energy source. At higher altitudes, wind conditions are much better. Floating windmills, which send the generated electricity to the earth by means of a cable, could harvest much more energy. Wind speed increases with altitude. Because wind power corresponds with the cube of wind speed, the amount of energy that can be harvested grows exponentially as one goes higher. Historical data from the Dutch weather institute shows that at a height of a thousand metres, wind power is on average 6 times stronger than at an altitude of 100 metres. At an elevation of 5,000 metres, there is 17 times more wind power. At a height of 10,000 metres 30 times more wind power can be gathered. Holland is a very windy country, but elsewhere in the world very high wind speeds are also common in high layers of air – except for the areas near the equator and those close to both poles. By harvesting only a fraction of that wind power, in principle man could obtain enough energy to satisfy its growing needs. A common wind turbine stands at a maximum of 125 metres tall – twice as high as ten years ago. Nothing stops us from building even taller windmills, but floating wind turbines could provide a cheaper solution. The idea is all but new. At least 3 inventors have been testing the concept for some decennia, making models and building small prototypes. One of the pioneers is Dutch astronaut Wubbo Ockels. His Laddermill consists of two wheels and a cable of several kilometres long. One wheel is fixed to the ground and is connected to a generator. The other wheel is high in the sky, fixed to a large kite. Dozens to hundreds of small kites are attached to the cable. Powered by the wind, they make the cable go round the wheels. 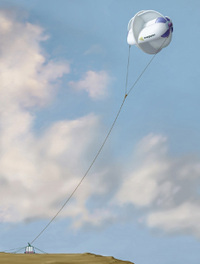 Another concept is the ‘Flying Electric Generator’, devised by the Australian professor Bryan Roberts. This flying windmill is based on helicopter designs. A motor and rotor blades raise the machine to the desirable height. Once up in the air, the same rotor blades hold the device in place, so that the motor can be shut down. Both concepts are meant to be used at a height of several kilometres. The chances that they will ever work seem rather small. Especially the steering of the constructions is a big challenge. A sophisticated automated system is needed, or trained ground personnel. Canadian firm Magenn Power developed a more uncomplicated concept, based on the principle of zeppelins. It concerns a helium filled balloon. Around the balloon is a wheel, driven by the wind. Inventor Fred Ferguson also has been working on the system since the eighties – but today it is the concept which is closest to reality. In contrast to the others, this machine stays in the air without problems. Helium is lighter than air, which means that the windmill keeps floating even when the wind is gone. 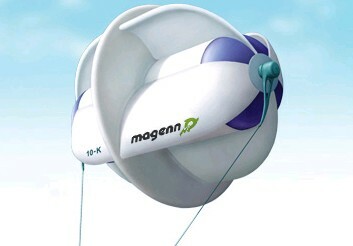 If all goes well, the floating wind turbine of Magenn Power will be on the market in 2008. The first model will deliver 10 kilowatts of electricity, and floats at a modest altitude of around 330 metres – more or less twice the height of a normal windmill. Larger versions are planned, and the company also aims to develop a small system that fits in a backpack. The drawback of the technology is that the balloon has to be re-filled with helium every 6 months, seeing as the gas leaks. Because floating windmills can harvest more wind, they have the potential to make wind energy cheaper. Their price is comparable to that of a common windmill, but they give more electricity in return. According to the calculations of Magenn Power itself, the price per kilowatt-hour would be lower than the price of electricity generated by fossil fuels. The lower cost would also mean that windmills could be put into action in places where there currently is not enough wind close to the land surface. 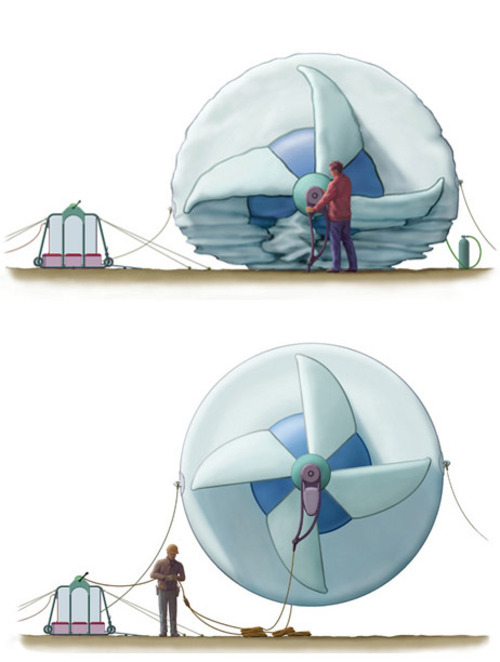 However promising the idea may sound, it has one important disadvantage: floating windmills can plunge down. At first sight these energy plants seem to be saving space, but that is not necessarily true. Below a floating windmill park, nothing can be build. That also means they can not be used in cities, exactly where they would be at their most useful. Another disadvantage of floating windmills is that they have to be taken down in extremely powerful winds, whereas common wind turbines are simply shut down. Build your own windturbine : building plans for the low-tech "Windbelt". Cargo ships, then and now : which one is fastest?